Halo Radar delivers a maximum range comparable to traditional 6kW pulse radar, at up to 72nm with the HALO-6 Radar’s 6-foot open array antenna. It offers unprecedented 10m (30ft) minimum range, peering into that pulse-radar blind spot where once only FMCW (3G/4G) Broadband Radar could operate. Separating one radar target from another is key. Beam sharpening provides the Halo Radar with exceptional Target Separation Control for discriminating between radar targets, granting the Halo Pulse Compression Radar’s 6-foot open array antenna the same effective target resolution as an 8-foot array without beam sharpening. With Dual Range, Halo Radar functions like two arrays in one monitor two distance ranges simultaneously with independent displays, controls, and totally independent MARPA target tracking. Take full advantage of Halo Radar’s combination of short-, mid-, and long-range performance to keep an eye on faraway weather cells, while monitoring channel markers and high speed watercraft up close. 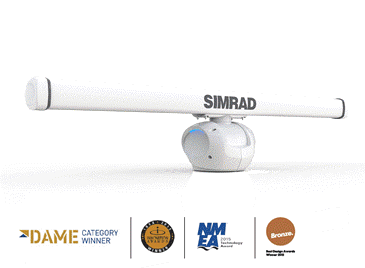 Dual Range operation is available with Simrad NSS and NSO multifunction display systems. Installed 15m high, the HALO-6 Radar meets tough IEC 62388 Annex D target detection specifications (excluding beacon and RACON triggering). Installed 3m high, the HALO-6 Radar offers greater target detection performance than our proven Simrad TX06S-1 6kW/4-foot open array pulse radar. Halo Radar’s solid-state technology is ready instantly from standby, and in just 16-25 seconds from power-on to fully-operational. Avoid the 2-3 minute warm-up time associated with traditional pulse radar, and trust Halo Radar to produce an immediate, accurate radar image when you need it.